… And then he was in free fall! The highest hex came away as he fell. There was no time to think or react! The rope tightened on a friend, his last protection. It held and I was lifted off my feet, heading upwards as he was heading down; my weight counteracting his downward fall. He stopped just one foot above the ground; me dangling above, not daring to slacken the rope. If photography is about capturing moments then this is certainly one! Polly took this picture once we’d picked ourselves up off the floor. The suddenness and shock and speed of the fall meant capturing it would have been nigh on impossible. But there’s something about this shot that captures the aftermath perfectly. 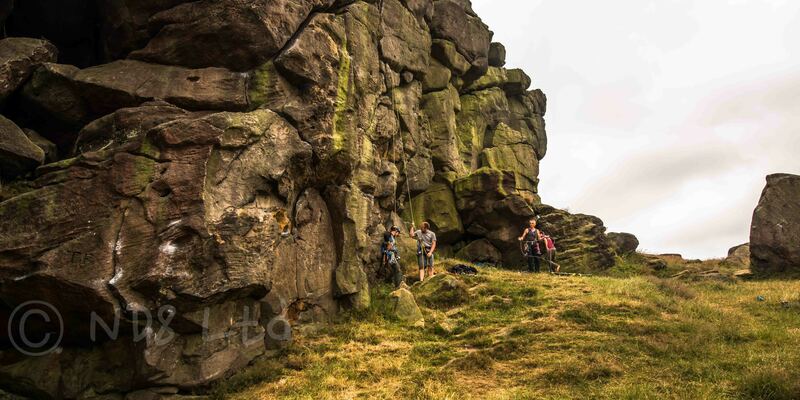 The crag looming over us; Anthony slumped against the rock; me gripping the rope; the rope still tight; the one bit of gear, the friend, still in place; and I think I can just make out a smile, as people often do after a lucky escape. It was Anthony’s first major fall when leading. It was my first major fall when belaying. I think it’s a moment that neither us will ever forget!